Microsfoft announces the Azure FXT Edge Filer a high-performance tier between compute and file storage. Microsoft has revealed the upcoming launch of its Azure FXT Edge Filer. The caching appliance with support for Azure Blob will be showcased at NAB, this week. Linux performance over NFS - According to the company, the Azure FXT Edge Filer solves latency issues between Blob storage and on-premises computing with built-in translation from NFS to Blob. The solution sits at the edge of your hybrid storage environment closest to on-premises compute, caching the active data to reduce bottlenecks. Common applications of the Azure FXT Edge Filer include Active Archives in Azure Blob, WAN Caching, and NAS Optimization. In cases where Azure Blob is a target storage location for aging, but not yet cold data, the Azure FXT Edge Filer increases access to files by making an on-premises cache of active data. The Azure FXT Edge Filer caches active data closest to the users and hides that latency as they reach for data stored in data centers or colos. 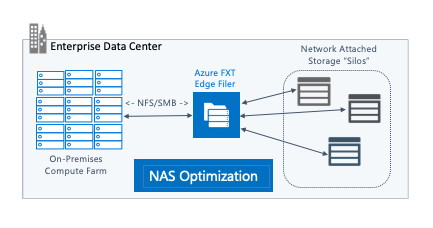 The Azure FXT Edge Filer also optimizes NAS systems by means of caching data closest to the compute. It separates performance from capacity and better deliveres both. In those cases when datasets are too large, hybrid file-storage caching provides performance and flexibility that are needed to keep core operations productive. The company said that it is previewing the FXT 6600 model at customer sites, with a second FXT 6400 model becoming available with general availability. 6600 features 1536 GB DRAM, 25.6 TB SSD, 6x25/10Gb + 2x1Gb Network Ports, Minimum 3-node cluster and uses 256 AES encryption . While 6400 packs 768 GB DRAM, 12.8 TB SSD, 6x25/10Gb + 2x1Gb Network Ports, Minimum 3-node cluster and uses 256 AES encryption.